Kind of a funny street shot I took this summer. I’m not sure how stoked this guy was I was taking his picture haha. He couldn’t have cared too much thought, because he didn’t say anything to me :). 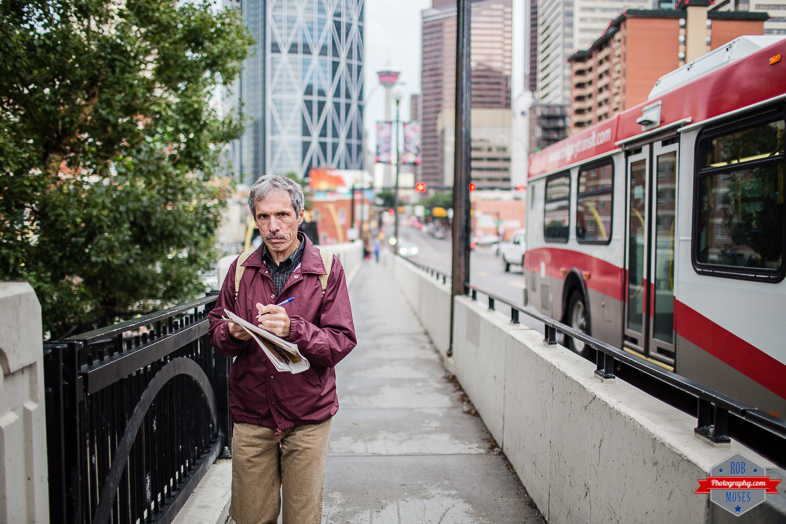 I was walking across the Centre Street Bridge here in Calgary the other day and I saw this guy walking up the bridge doing a crossword puzzle while walking! I put my camera up to my face and kept walking in his direction waiting for him to put his face up to see where he was going like a whale in the sea bobbing up for air haha. As soon as that face popped up, CLICK! Gotchya! And I just kept on walking haha. His facial expression is hilarious, because he seems to be confused as to why there is a camera in his face rather than another zombie faced pedestrian haha. I love these little street photography interactions with people :). 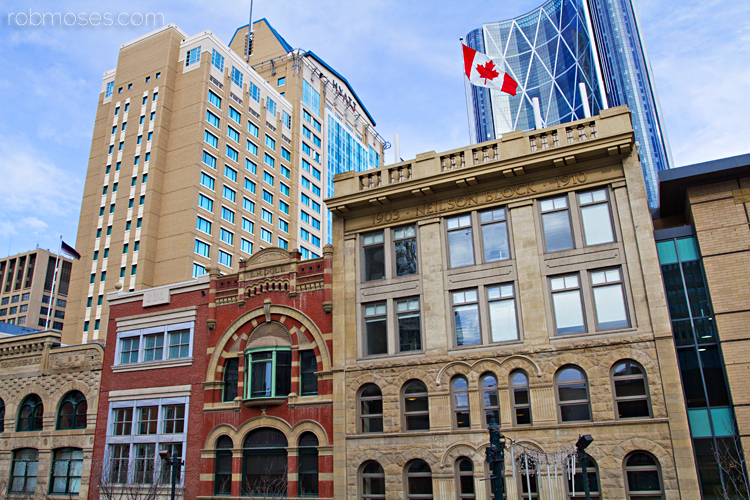 Here are a couple Calgary pictures I took with my Sony QX100. A funny little camera that produces good results :). Last week I decided to dig out my Sony QX100 and snap a couple of photos with it when I was walking downtown one day. In the first shot, I was crouching on the grassy hill by the street waiting for a biker to come by, when this guy came zooming I got the shot I was after :). In the 2nd shot I was perched on this little bridge look out and just took the shot when I had a few interesting people in the shot to hold down the bottom edge of the shot. This is one my favourite pictures I took of the summer. 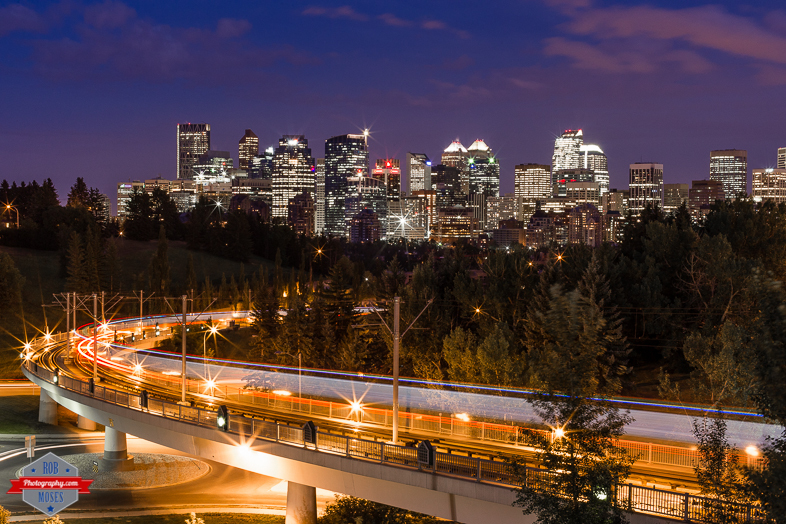 It’s one of the subway bridges going over a street with part of the Calgary Skyline in the background. 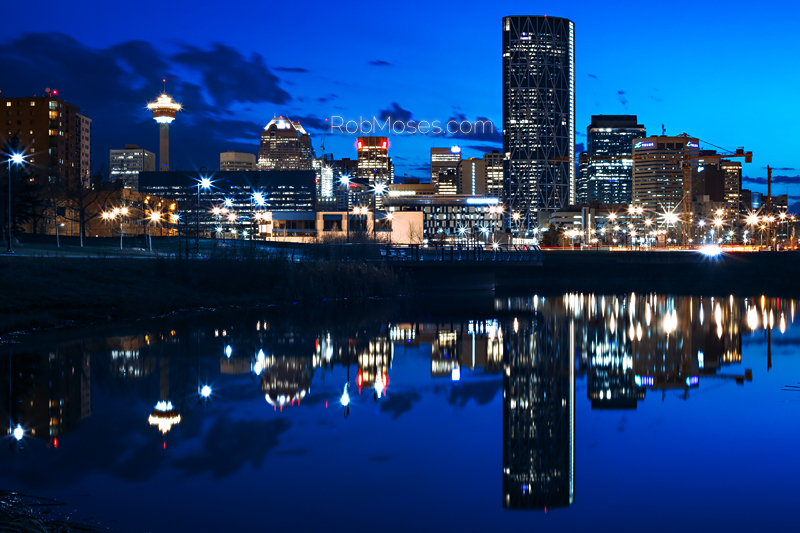 I shot this photo last night from SAIT (a local college). I got there a bit early and tried a few shots while it was lighter out, but I knew waiting till the sun when down more would give a much better effect. Once the sun went down more I waited for a train to go by so I could get the lights streaks in the shot. I had my camera on a 2 second timer, but timing for the train was still rather easy because just before the train comes into frame there is a cross walk with bells that ring. Anyhow, it was a nice night and I’m happy with the picture :). This spot is a particular favourite of mine in Calgary. 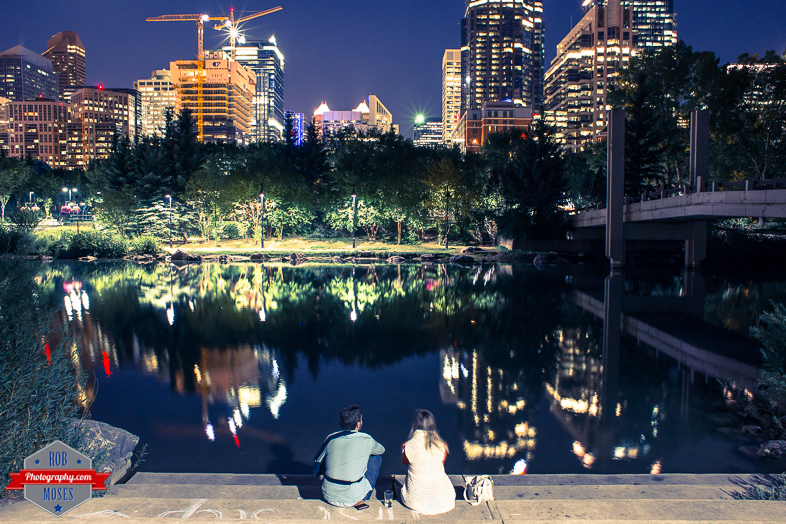 The pond is in Princes Island Park and is a nice place to grab a seat and relax. I think theses 2 people would agree that this is the place to be :). I shot this one a week or so ago and thought it might also be worth sharing here :). I shot this on Tuesday evening off an overpass near my house. The previous day I was driving over said overpass at the exact same time I took this picture. As I crossed the overpass I saw right away what a great shot it could be, so I noted the time and came back the next day. The photo is not exactly how I had pictured it in my mind, but it’s pretty close :). If you’ve liked my Facebook page you probably already seen this photo before. But if you haven’t, well here you go! ;). 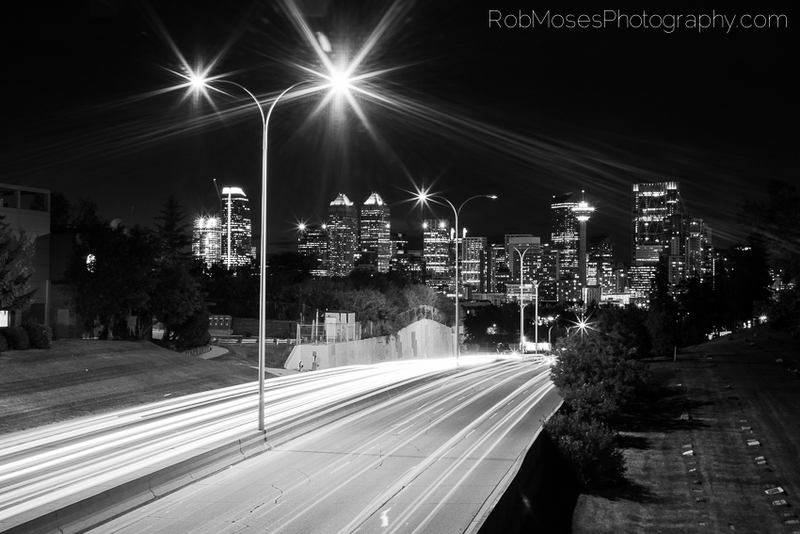 I shot this one from an overpass on one of the busier streets in Calgary. I like the vantage point because of the urban backdrop. * Update: Due to the flooding in Calgary I was unable to meet up with my friend. We are rescheduling and I will have her on here at a later date. Click photo to see bigger & sharper image. Last weekend I went for a little walk through the East Village and into Inglewood along the the riverside. On my way back downtown I walked by this little pond and immediately pictured this photo in my mind. At the time there was a bit of wind and the water wasn’t quite still, but I imagined with the right weather and time of night a good picture was to be had. I went back a few days later when there wasn’t a lot of wind. When I showed up to shoot the photo the pond was rather still and I was excited. As I made my way down the embankment to get the right spot for the reflection I wanted I heard some splashing. I stopped setting up and watched the pond for a moment to see what was going on. To my surprise more splashing started to occur and then I saw something swimming around, it was a beaver! Although I found this little beaver to be quite amusing and fun to see, now was not the time. The beaver was creating a lot of unwanted ripples in the water. Also the night was falling fast and my window of opportunity was slipping away for the sky I wanted for my picture. So naturally I decided the best course of action would be to try and reason with this non-english speaking animal haha. “Hey beaver, can you please stop swimming and splashing! I only go so much time to get this shot”. Now as ridiculous as that sounds (a grown man in the dead of night talking to a beaver in a pond), it seemed to have worked. He swam around for another few minutes and finally decided to listen to reason and let me shoot my photo. 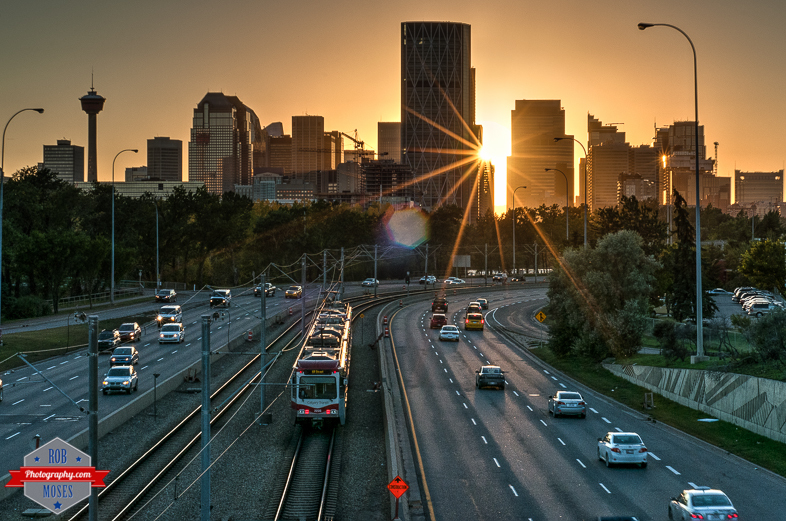 I decided to start adding some pictures of the city of Calgary it self. I thought this might be interesting for some of the readers who have never been to Calgary before. Kind of like putting a face to a voice if you will 🙂 Clearly this photo cuts off a few stories of the buildings directly in front, the reason is I was shooting it from a couple stories up. 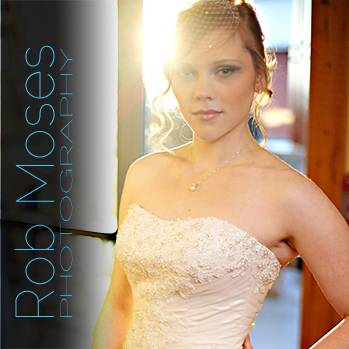 Wedding & Lifestyle Photography in Canada & The USA. Jeremy – Neighbour to the Stars! Donate to The People of Calgary Project if you are so inclined. If not, cool haha ;).